Taste test: These rippled potato chips are quite crunchy, as the name implies. They're strongly flavored, so I probably couldn't eat the whole bag at once, but at least they're not dull. 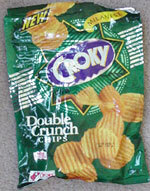 This snack was discovered by Jeremy in Amsterdam.